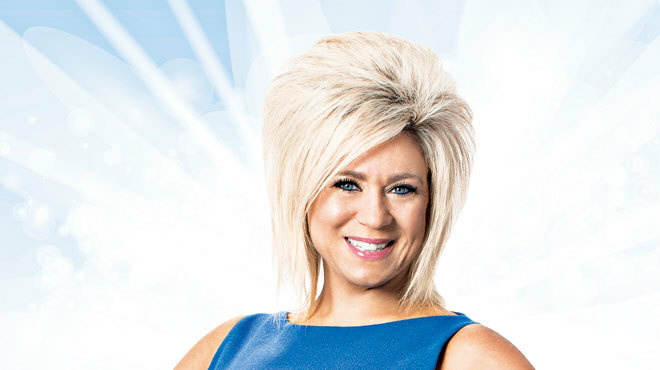 Theresa Caputo’s claim to fame is her gift for speaking to those who have passed, and millions of fans of her television show, Long Island Medium, are hard-core devotees. Last week, she stopped by the Time Out New York office in Times Square (along with her husband, Larry) and held an intimate reading for our staff; lost parents, grandparents and friends showed up, and heavy tears were shed. Before Caputo heads to Brooklyn’s Kings Theatre this Saturday to read in front of thousands at Theresa Caputo Live! The Experience, we asked her how she hears from “spirit,” her term for the dead, and what she has to say to skeptics. I come onstage and give a quick speech on how I communicate with spirit, then I strictly get down to a good hour and 45 minutes of spirit communication. Spirit is going to guide me through the theater, whether you’re in the first row or the balcony. At the live show, it’s like watching Long Island Medium because you’re actually watching spirit communicate with someone and watching these messages change that person’s life right in front of you. People say, “I walked in there thinking, Pick me, pick me, and I left that theater feeling very blessed and realizing there were other people needing to hear from their loved ones more than I.” That just shows people really do get it [regarding] spirit’s messages and the healing process. Is an audience full of New Yorkers different than an audience somewhere else? I feel that New Yorkers get my personality, and they understand my accent. I have the most amazing fans and there is nothing like performing in your hometown. You were a child when you first became aware of your abilities. How did you come to understand them? I first thought it was normal—I thought everyone sensed and felt what I was feeling. As I got older I realized, no, not everyone was sensing, feeling and hearing everything I was, and then I blocked it for many years. I come from a very spiritual family, and I was always able to express what I was feeling. The best thing my mom ever did was not make me feel that I wasn’t quote, unquote, normal. And I always say, whoever decided what normal is? One day I just put it in God’s hands and said, “Look, if this is what I was meant to do, then you will lead the way.” And here I am. Fifteen years ago, I couldn’t even leave my house. Now I go away by myself, I travel in a tour bus across the country, and it all comes down to loving and honoring yourself. When you embrace who you’re meant to be is really when your life becomes complete, and no one can tell you that but yourself. What do you mean you couldn’t leave the house? I was petrified. You have to understand—I would sense and feel things. The second I would leave my house to go to, say, Target, it would be like someone was standing next to me. Can you imagine if you feel like someone’s choking you and nothing’s happening? So I’d leave the store, and the feeling would leave because I was leaving the energy. Now the pain leaves me because I deliver my message like I’m supposed to. Why do you give these messages to people? Spirit brings up things to help you make tomorrow a little bit easier. And to be able to give someone the gift to be able to live life with a little bit more peace, joy, contentment and closure is something that nobody can buy. Is reading taxing for you? Sometimes before a reading I’ll become a little drained, but after a reading I actually feel energized. Do the symbols appear to you as a mental image or is it more something you feel? It’s more of a feeling for me. I can’t explain how I go into such detail. Like [in today’s reading], I could feel someone holding my hand and wrapping around my soul, but I also see flashes [like a flipbook]. Sometimes I do hear a word or a whole sentence. It’s almost like they take the sentence and implant it in my brain. I can’t explain it. It just happens. When people say, “How do you do this?”—you watched, how do you explain what happened? I can’t explain much of anything. But you see how that changed someone’s life in a positive way. What’s wrong with that? That’s what it’s about. You don’t share negative readings, and you only communicate with passed people who are “in the light of God.” Do you think you’re talking to people from heaven? That’s how I see it. Spirit never tells me, “Theresa, it’s hot down here,” so I go with, there’s no hell. When I found out about my gift, I said to God, “If this is my path, I want to use it to help people.” And it was about burdens and guilt and restoring people’s faith and being able to live a positive life after the loss of a loved one. Look, maybe there is a hell, I don’t know—I’ve never seen it, I don’t want to know about it. Spirit has shown me there’s different levels—there are lower levels where spirit has to grow their soul to get to a certain point. I don’t know—I’ll find out when I get there. How is the experience of talking to your own relatives or friends? It’s a little harder because I’m the medium and the client. When I watch Long Island Medium I don’t see the episodes before they air, so I’m crying right along with you every Sunday night. If you see me cry at my live show, it means spirit got to a part of my soul that they weren’t supposed to, because I can’t have any of my own personal thoughts when I read. I’d be a hot mess. So it’s harder for me to read my own loved ones because you’re connecting with it. What would you tell people who feel they also have these gifts? I’m just Theresa Caputo from Hicksville and I have the amazing ability to talk to loved ones that have died. I believe everyone has that gift. I always say, just embrace it—take them as little hellos. Anything that goes on around you that is odd, weird, different or coincidence, embrace it at that moment and know that they’re with you. You had mentioned during our reading that spirit can move things. Can you expand on that? Sometimes they’ll make a light flicker. They can actually turn things on and off. Sometimes spirit has acknowledged they play with the volume on the TV. Energy has the ability to move things and effect things, so if you notice pictures crooked or turned for no reason—it’s just like the movie Ghost. Do you have advice for those who are mourning? That’s hard because I believe we will grieve the loss of our loved ones for the rest of our lives, but what we have to learn is healing, and to be patient and kind to yourself and know there’s no right or wrong way to grieve. What do you have to say to nonbelievers? I respect [that] it’s an opinion, but how can you tell someone that what they experienced isn’t real? To them it is real. That’s why I always say witness it yourself. If someone is a skeptic, they’re not going to believe if they don’t want to. 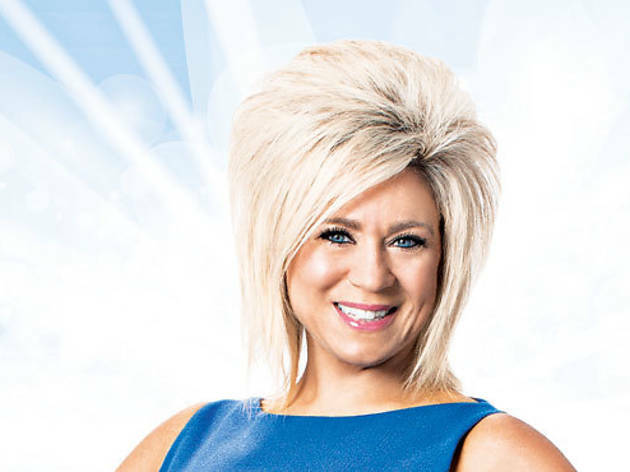 Theresa Caputo’s claim to fame is her gift for speaking to those who have passed, and millions of fans of her television show, Long Island Medium, are hard-core devotees. Now you can see her do a live reading and judge for yourself at Brooklyn’s Kings Theatre.